International superstar Lionel Richie will return to the UK in 2018 with a show at Scarborough Open Air Theatre. This not-to-be-missed Yorkshire coast date on Tuesday June 19 is part of the music icon’s summer tour which will visit stunning open-air venues across the country. Fans will be able to enjoy timeless mega-hits and sing along to classics such as ‘Lady’, ‘Truly, ‘Dancing on the Ceiling’, ‘Say You Say Me’, ‘Hello’ and ‘All Night Long’. 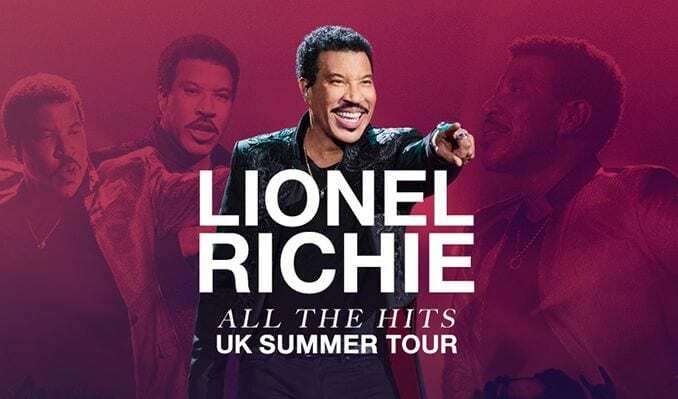 These will be Lionel’s first UK shows since receiving glittering reviews for his ‘All The Hits’ tour which included three nights at London’s The O2. The dates followed a phenomenal Glastonbury 2016 performance which drew the biggest crowd of the weekend as more than 200,000 people flocked to the Pyramid Stage. Lionel’s incredible success continued as his album ‘The Definitive Collection’ topped the charts and provided his first UK Number 1 in 23 years. Lionel went on to receive British GQ’s Icon Award adding to a celebrated career which includes the O2 Silver Clef Award, four GRAMMYs, a Golden Globe and even an Oscar as well as the prestigious Nordoff Robbins O2 Silver Clef Award. In 2016 Lionel launched his on-going Las Vegas headline residency show, ‘Lionel Richie—All the Hits’, at The AXIS at Planet Hollywood Resort & Casino, where he takes his fans on a spectacular musical journey, performing a variety of his seminal hits. Having sold more than 100 million albums worldwide he recently joined the judging panel on ABC’s American Idol. Lionel Richie joins a stellar 2018 line-up at Scarborough OAT – Europe’s largest open air theatre – that includes international pop icon Britney Spears, Il Divo, Gary Barlow, The Script, Steps and Alfie Boe. Tickets go on sale at 10am Friday from www.ticketmaster.co.uk and www.scarboroughopenairtheatre.com or in person from Scarborough Open Air Theatre Box Office (01723 818111) and the Discover Yorkshire Coast Tourism Bureau (01723 383636).